Harlan Ellison has called it one of the greatest science fiction films ever made. I agree. 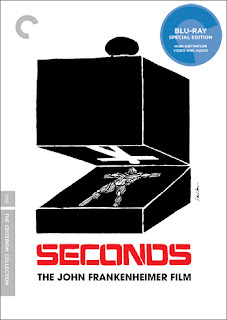 Seconds is a dark, challenging, beautifully shot film. The premise is a simple one, what if you could have the life you always wanted? I was lucky enough to see John Frankenheimer present his personal print of this remarkable film in 1999 at the Chicago Film Festival. It was an amazing evening, and the most pristine print I've ever seen. It was crystal clear. Not a blemish. I'm very excited to see Criterion issuing a Blu-Ray of this overlooked masterpiece in August.